indicates major routes and major and secondary cities and towns. showing cities towns, villages, game reserves, nature reserves and distances. 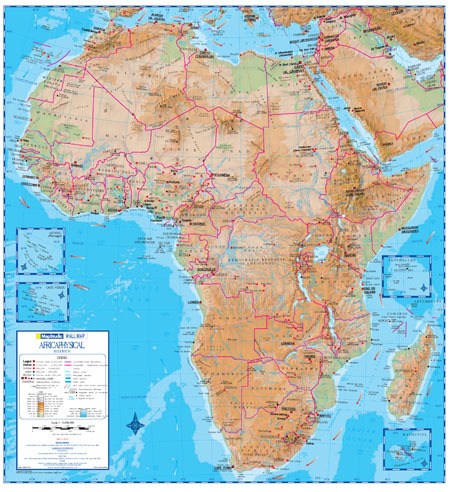 The Africa Physical Wall Map is colourfully illustrated and printed with useful information. disputed political boundaries, terrain and ocean currents. the highest peak in each country. Coverage also includes Seychelles, Mauritius and Madagascar. Comprehensive physical map covering the whole of Botswana showing cities, towns and villages. Comprehensive political map covering the whole of Botswana showing political boundaries, cities, towns and villages. from our reliable map database. It features easy-to-read text on a large format map sheet. Latitude and Longitude lines, a map legend, locator map, north point and scale bar. Comprehensive map covering the whole of Mozambique showing cities, towns and villages, includes extensive road detail. places of interest and parks. Includes Etosha, Namib and Skeleton coast and Caprivi Strip in the north-east. Covers central and Southern Africa from the northern border of the DRC, has political colouring. Shows capitals and main towns, major routes, national parks and much more. Full coverage of South Africa, Namibia and Zimbabwe. Includes partial coverage of Mozambique, Malawi, Zambia and Angola. Mozambique, Malawi, Zambia and Angola. Detail covers roads, cities, main towns, game reserves and nature reserves. Africa Political Poster in Tube. Political, coloured-coded map of the African continent which indicates major routes and major and secondary cities and towns. Packaged in a convenient tube.